Having completed a 20,000 mile motorcycle journey from London to New York in 2004 with the successful television series, Long Way Round, most people would've believed that riders Ewan McGregor and his best friend Charley Boorman had had if not the adventure of a lifetime than had earned themselves a nice, long break to relax with their families for a few years. But, speaking as the daughter of a man who has the motorcycle bug himself, that's just not how bikers operate. It's always the next trip, the next experience, and the next adventure that entices and while most average bikers are fine trekking around these fifty states, McGregor and Boorman still have that boyhood twinkle of mischief in their eyes and one instantly knows that they won't be content to just ride around the U.K. and wave at passersby blasting "Born to be Wild" on their iPods. No, instead, they made plans for a second international journey and while one initially thought it was wise they were dropping the mileage down 5,000 miles to a 15,000 mile route, I can only imagine the look of shock on the faces of their family and friends when they announced that their follow-up adventure, entitled Long Way Down would find McGregor and Boorman traveling through as many as 20 countries making their way from John O'Groats, Scotland to Cape Town, South Africa, "descending through Western Europe and Africa before arriving at the southern most tip of the continent," as the DVD box explains. A journey throughout the whole of Africa and the kicker is, the duo have never been there before. Re-teaming with the same group with whom they worked alongside for Long Way Round, Down finds the two riders as well as Claudio Von Planta (cameraman and head director of photography), cameraman Jimmy Simak, producers Russ Malkin and David Alexanian, a medic and security man, and of course the latest BMW model in the Adventure bikes series-- namely the R1200GS Adventure-- all ready for action. Beginning their trek on May 12, 2007 and concluding on August 4, 2007-- the 10 episode series which has been played on the BBC during its production and here in the states on the Fox Reality Channel this past August, is finally making its way to DVD shelves in this incredible digital transfer onto a 3-Disc set, loaded with extra material including previously unseen footage, interactive route maps, a photo gallery, and McGregor and Boorman's African documentary entitled The Missing Face. Following the men from the initial planning stages (check out the map here) as they set up shop in London and begin to try and tackle all of the foreseeable hurdles they'll encounter including one woman employed for "visa" patrol in ensuring the eight-men crew can make roughly twenty border crossings uninterrupted but in the end, the American members are denied access to certain countries. Additionally, they undergo strength and conditioning work, survival exercises as well as a hostility training course to face the human threat of a continent where people frequently go missing and machine gunfire is a regular occurrence. Following an intense hostage training exercise where Charley learns the hard way not to ever try and abandon his group, they end up contemplating body armor or bullet proof glass on their SUVs before disaster strikes at home when Ewan cracks his ankle on a routine motorcycle ride in his neighborhood. 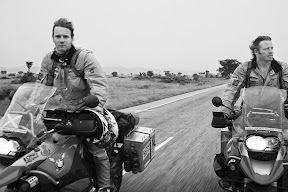 However, eventually the journey begins and this time, they're in for yet another surprise when Eve, Ewan's wife who's never climbed aboard a motorcycle in her life, makes the decision that not only will she learn to ride but she wants to meet up with the guys in the eighth episode when they cross into Tanzania and head onto Malawi. Although Eve, like Ewan and Charley had undergone some bike training before the journey, there's discussion in the first episode regarding the safety of having two parents in an unpredictable landscape together should disaster strike whether it's in the form of violence or a simple accident on the sand and viewers are left as nervous and apprehensive as some of the show's producers about the decision. With eight men traveling together, there are stretches when they begin to wear on each other's nerves and a few instances when some are barely speaking as an ultra-tense Charley, still on edge about his ill wife who insisted he leave on schedule, is detained at London Gatwick Airport after mentioning the word "bomb" and must meet up with the men later. However, throughout the journey, it's the lure of adventure and the importance of working together (whether it's when vehicles are stuck in the mud or when the elements attack) that make them put aside any petty grievances. An excellent and gorgeously photographed travelogue that shows not just the majestic beauty of Africa but also its tragic history as the men deliver goods on behalf of UNICEF and also visit the genocide museum and site of other horrific tragedies, yet the one area where Long Way Down falls short is one with which I think our riders would wholeheartedly agree. With a breakneck three month schedule of 15,000 miles, the men end up having to do so much riding that they're unable to take in enough of the landscape and perhaps get a far more accurate picture of life, instead of constantly being forced to zip by along the endless sandy roads. Filled with self-deprecating humor by the leads, especially when McGregor and Boorman tour the set of the original Star Wars (now a makeshift museum) and McGregor isn't noticed by any tourist there (which is an amusing blow to the ego) as well as some truly moving scenes as we meet the child survivors who'd been abducted and forced into Ugandan armies, it's an effective, high quality documentary series on a number of levels. Far richer than most "reality shows," I hesitate to give it such a label that would place it in the same category as Wife Swap and Wipe Out, but best experienced as a humanistic documentary, the 3-disc set of Long Way Down is currently available in select stores and via Amazon along with a companion book, soundtrack and other materials from the original Long Way Round which started it all.